The game is set in Melveille, where the twins help their alchemist father on a daily basis. Unfortunately, they are young. Inexperienced. Fortunately, they discover a mysterious painting. The world in the mysterious paintings can be freely explored, an include materials not found in the less-than-extraordinary world. There are many to be explored, allowing the sisters to learn and grow quickly as alchemists. Puzzle-like synthesis returns, but this time Activation Items are being included. These special items are used during synthesis and each has a different effect. The twin element really comes into play during the battles, where Lydie and Soeur’s battle styles will change depending on team formation. A party can consist of up to three teams, each with two characters. The front teammates attack the enemy directly while the one in the rear support their partner. Players can also synthesize during battle. 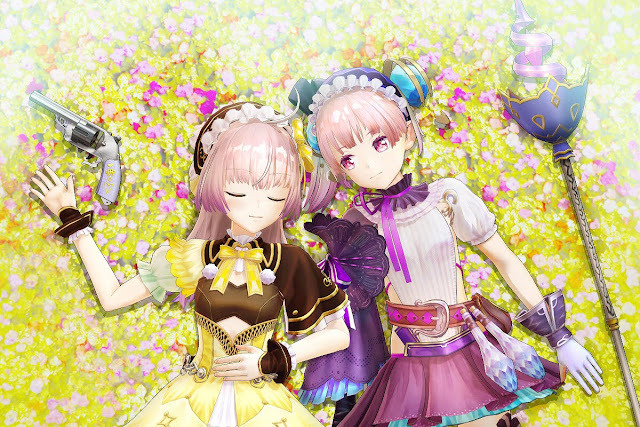 Atelier Lydie & Soeur: Alchemists of the Mysterious Painting will be released for PlayStation 4, PS Vita, and the Nintendo switch this winter in Japan. Don’t worry, a worldwide release is imminent. The title tells a completely new story, with modern graphics and new interactions with vision-like apparitions. Achim Heidelauf, the upcoming game’s producer, was also Executive Producer on 2009’s Black Mirror II. In a press release, he states, “Black Mirror is a series that is really close to my heart, and it was fantastic to be immersed in the Gothic horror genre again; the human psyche is a fascinating playground!” The new title won’t be the classic point-and-click gameplay as the original trilogy, which both saddens and excites me, but it sounds as though the developer has tried to retain the feeling using close-up investigation. The game’s eerie atmosphere focuses on the horrors of the brain rather than the horrors of the environment, mimicking the style of Edgar Allen Poe and HP Lovecraft. Black Mirror is expected to be released on November 28 for PC/Mac/Linux, PlayStation 4, and Xbox One. The limited edition includes the game, a reversible cover sleeve, novel book, art book, cloth poster, and a collector’s box. It’s worth it for the Blood Maidens cloth poster alone, with the bold graphics and 18” x 21” size. The Novel Book delves into the origins of the Blood Maidens via 100+ pages of short-stories and full-colour artwork. The art book is always a favourite in limited editions, and this one has galleries, character information, and rough art. 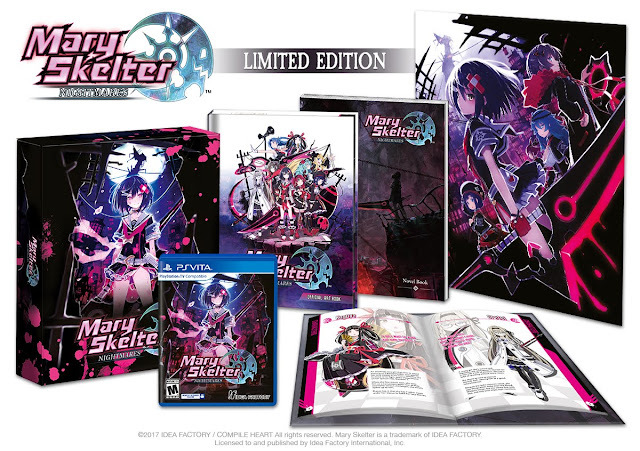 Mary Skelter: Nightmaters will be released for PS Vita next month – September 19 for North America and September 22 for Europe. Preorders for the limited edition are exclusive to Iffy’s Online Store and begin on August 22. My fingers are crossed for an eventual PlayStation 4 release! Cyberdimension Neptunia has a firm release date! October 10. October 10 is the exciting day that Idea Factory’s latest game starring the delightful girls from the Hyperdimension Neptunia series (October 13 for European players; sadly, it’s a couple of days later than the US release). Cyberdimension Neptunia is set to be a fast-paced action JRPG. Developed by Tamsoft – the same team that handled the various action JRPGs on PlayStation Vita – this promises to be a far bigger (and better) game, which parodies MMO conventions and gameplay styles, even as it looks just like one. Idea Factory also posted a minute of gameplay footage and, yeah, the game looks gorgeous, with some fast-paced action, big bosses, and plenty and plenty of cute girls. We can’t wait.